We routinely perform service, inspection, installation, replacement and repairs on all types of mechanical systems. In this gallery you will find some pictures we have taken recently of our services being performed around the Las Vegas area. As you can see we have the experience, knowledge and equipment to complete your service properly the first time. 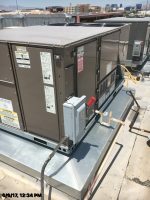 Commercial Installation and Service for air conditioning, evaporative coolers,chillers, heaters, refrigerators, freezers, water heaters, and kitchen equipment. Please enter a number from 9 to 11.